When the speed is so great, a team jersey is the recognizable symbol that lets us know instantly which rider won by an inch over the finish line. When combined in mass, team jerseys create a blur of color symbolic of the pro peloton in movement. Together with the clatter of bikes on rough pavement and the sound of wheels slicing through the air, the colorful jerseys create the atmosphere of professional bike racing. Inside that blur of color is a dynamic mental struggle and physical fight to stay at the front of the race. From the fan's perspective the jersey, helmet, sunglasses, socks, shoes, and particularly the bike of a professional cyclists gives the impression of a calm, well trained, well equipped, well prepared athlete. The look is called pro, but being pro requires a legion of support staff and dedicated sponsors and partners. Team jerseys are the symbol of this sport. Team bikes make it all happen in a display of dream machines. 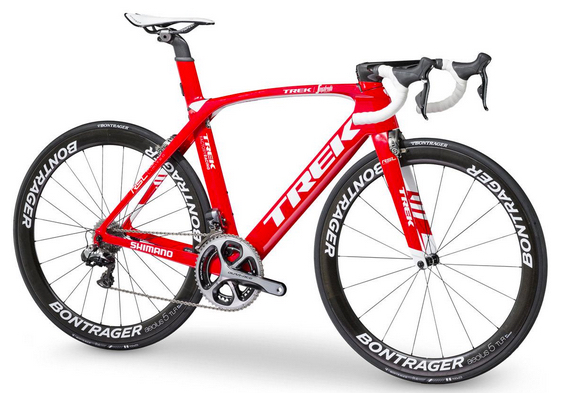 Of particular interest to the amateur cyclist's price point (depending on the build) would be the bikes of Team Katusha, Team Giant-Alpecin, Novo-Nordisk, Holowesko-Citadel, Direct Energie, Trek-Segafredo and Rally. 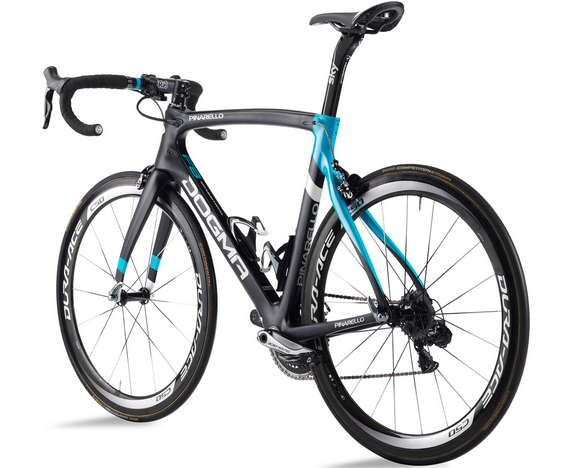 If you have no budget (or just want to drool over extravagant bikes) check out the bikes of Team SKY, Tinkoff, BMC, Etixx-Quickstep, United Healthcare, Axeon Hagens Berman, Dimension Data or the magnificent Team Wiggins team bike. Eighteen men's teams will compete in the 2016 Amgen Tour of California. 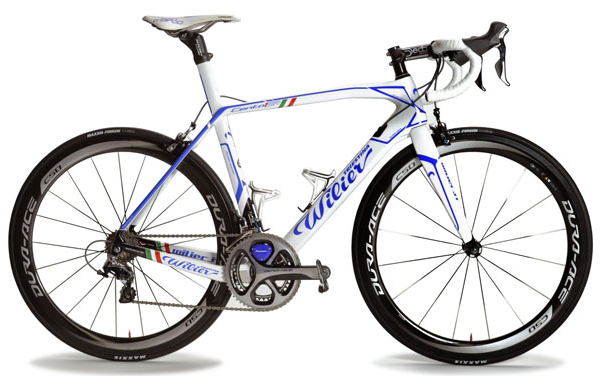 These are the team jerseys and bikes, listed by: team website, country, jerseys, bikes and some of the equipment used on the bikes. Each team has a large group of equipment, goods and service suppliers (including cars!) which can be found on their team websites. 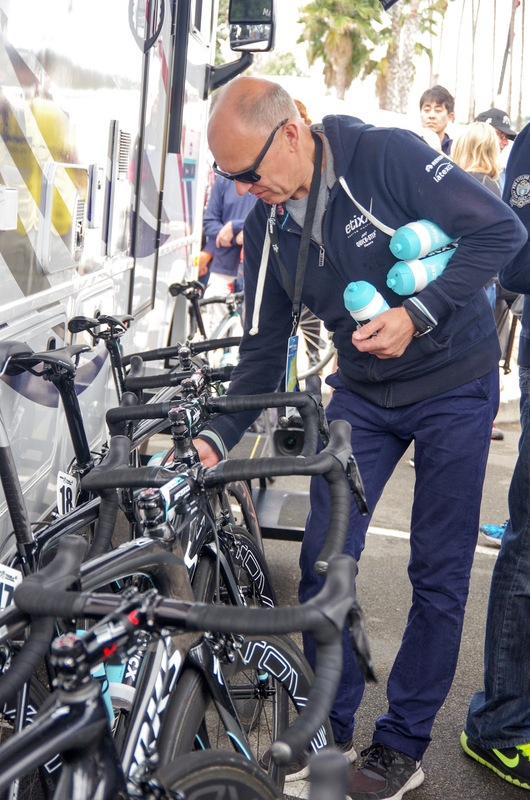 Read more about the WorldTour sponsors: Pro Team Sponsors – What Do They Do? By Inner Ring (descriptions of the products sponsors make). 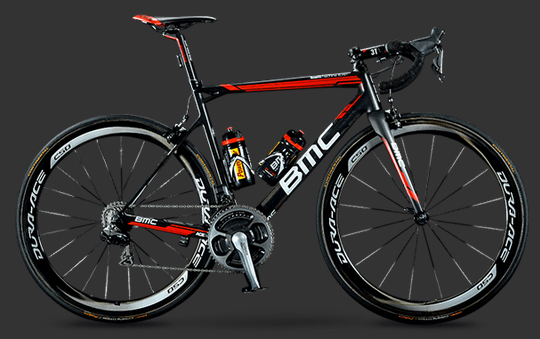 BMC team equipment on the bike: BMC, Shimano, fi’zi:k, SRM, Continental. 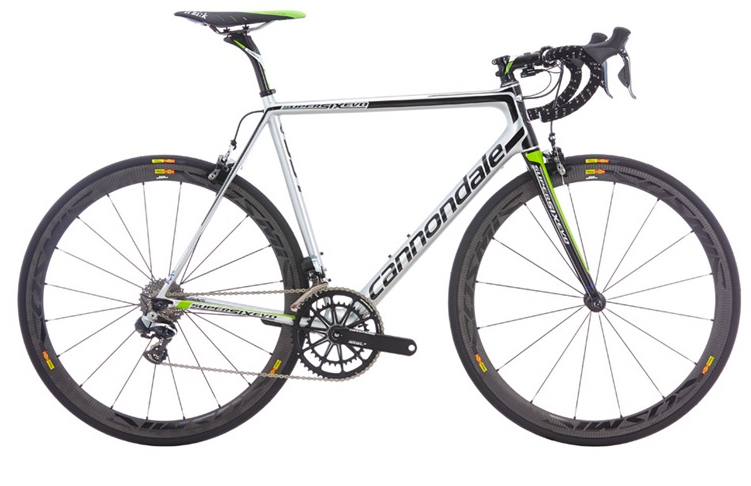 Cannondale team equipment on the bike: Cannondale, Shimano, Mavic, Garmin, FSA, Rock Tape, fi’zi:k.
Dimension Data team equipment on the bike: Cervelo, Roto Uno / Shimano, ENVE, Continental, fi’zi:k, Speedplay, Rotor, Lizard Skins. Etixx-Quickstep team equipment on the bike: Specialized, Shimano, HED, Rovel, FSA. Giant-Alpecin team equipment on the bike: Giant Liv, Shimano, Vittoria, Pro, Pioneer, Polar. 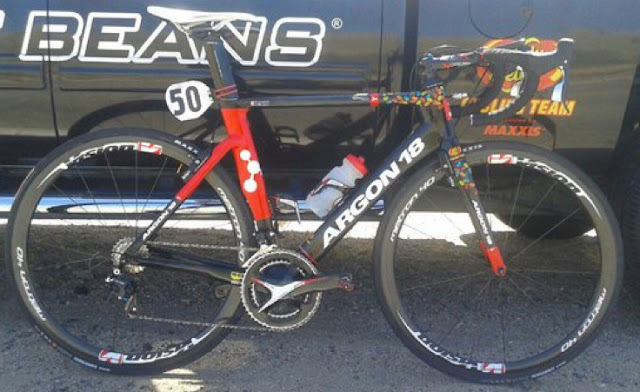 Katusha team equipment on the bike: Canyon, SRAM, Zipp, Quarq. Katusha swapped from Shimano to SRAM this year, and from Mavic to Zipp wheels this years, they also ride Canyon bikes, all products continuing to grow in tremendous popularity in the United States among amateur cyclists. LottoNL-Jumbo team equipment on the bike: Bianche bikes, Shimano, FSA, Selle San Marco, Vittoria. SKY team equipment on the bike: Pinarello, Shimano, PRO, Stages, fi’zi:k.
Tinkoff team equipment on the bike: Specialized, Shimano, FSA, Roval, HED, Look, Prologo, SRM. Novo Nordisk team equipment on the bike: Colnago, Maxxis, Selle Italia, Stages, Pioneer. Catlike helmets. United Healthcare team equipment on the bike: Wilier, Shimano, Maxxis, Pioneer, Deda, San Marco, Rocktape. 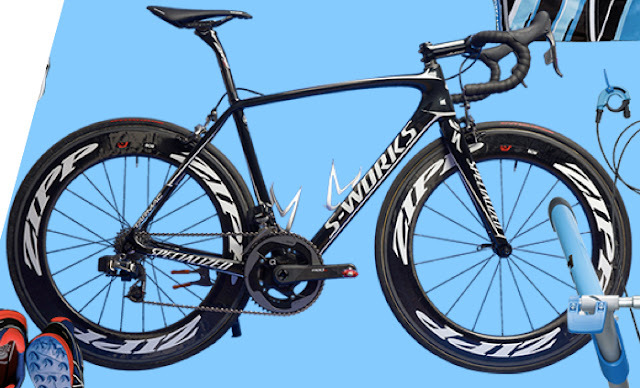 Axeon-Hagens Berman team equipment on the bike: Specialized, SRAM, Quarq, Zipp, Speedplay. Holowesko - Citadel team equipment on the bike: Felt, Shimano, Mavic, Michelin, Pro, Prologo. 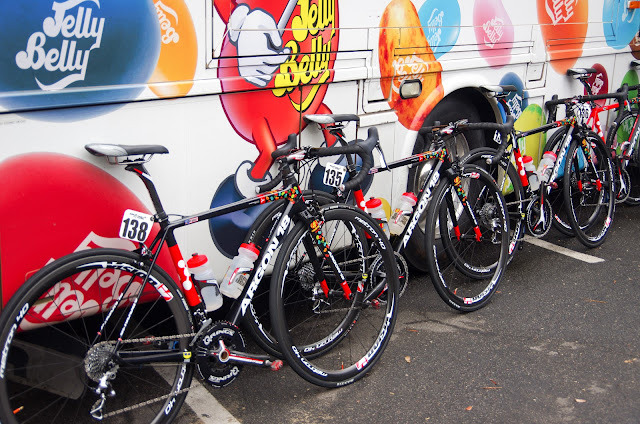 Jelly Belly-Maxxis team equipment on the bike: Argon, Maxxis, FSA, Prologo, Speedplay, Tocktape, Cateye and Jelly Beans. Rally Cycling team equipment on the bike: Diamond Back, SRAM, Mavic, HED, Kenda, Speedplay. 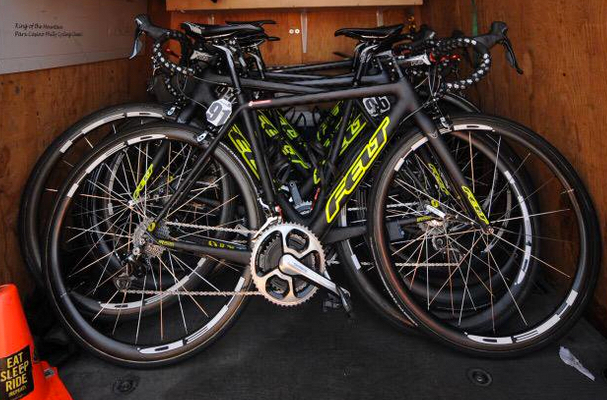 Oh, and wait until you see the team cars and buses at Tour of California!